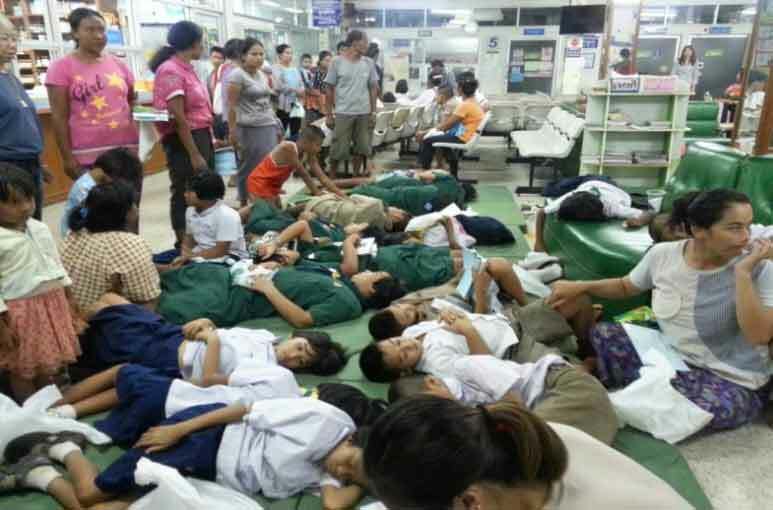 KANCHANABURI: -- The picture resembles a terrible tragedy with a hospital full to bursting with ailing children - but it was just the result of some dodgy "khaw moo daeng". Some 112 children and 4 teachers were taken to two hospitals in Kanchanaburi after they felt sick and started vomiting after eating their school lunch, reported Daily News. Twenty six kids and one teacher had to be admitted to Soi Yok and Phraphiyamaharat hospitals yesterday afternoon. They were from a school in Ban Phu Ong Ka in the Sai Yok area. The culprit was thought to be some khaw moo daeng (red pork on rice) that had gone off. The dinner was brought into the school by an outside supplier. Then let the outside supplier pay compensation. Just like Makro did. For a reaction so rapid I would suggest toxic contamination rather than bacterium. Very sad. Hope the kids recover soon and that it's not critical for any of them. Beyond ... belief, except in Thailand! Where was/is the Health "Department" OR common sense?! What do expect from food that is cooked in the morning and left out on display until lunch time. If it was me I would go to the hospital and have them test my blood to determine the cause, and request a intravenous drip with potassium and electrolytes for hydration and the proper prescribed medication. If they have diarrhea, begin to vomit, run up a fever, have chills, and tremors they should go to the emergency room immediately. Death could be only hours way in some cases. They should not be sleeping, but kept awake for 5 hours to communicate with them to determine if they need to go to the emergency room. A parent should be with them at all times. This happens a lot. Nobody is in charge? That had to be a good and proper bacterial infection for all the kids to fall ill so rapidly. The foods supplier is more than likely a small enterprise vendor and difficult to hold that person or company liable as the meat or other possibly contaminated ingredients were bought from various suppliers while none of them would be aware that their particular ingredient was / is contaminated ...until now. The health authorities have to be diligent and trace back to the various food suppliers involved and test the various ingredients bought from the numerous supply chain vendors. That and they have to check just how bacterial free or not bacterial free the meal suppliers working environment is and know if the food ingredients were not contaminated rather the cooking and food preparation environment is where the contamination is to be found...which is often the case. Food contamination is not near as widespread as it once was while many people are not aware of just how precarious it was to eat what is / was considered All Natural Food, back in the day. Millions of people died from a number of bacterial infections contracted by way of simply feeding yourself while each meal could be your last ...so to speak. Now a days we hardly think about that particular problem but sometimes food poisoning ( words used to describe in general the effects of food or consumed water born infections ) does occur while we have the means to stop the out breaks of sometimes deadly food born bacterial infections...fortunately. Still around the world and more so in poor countries and or under very unhygienic conditions several hundred thousand people a year die of the various and numerous kinds of bacterial infection classified under "Food Poising"
One way to stop intestinal growth based food born infections is to consume Probiotic supplements. I'm only surprised that this doesn't happen more often considering the horrifying lack of hygiene in Thailand, whether it's in restaurants ,markets , buffets or schools. Hardly any rule is respected , from basic cleanliness to cooking or conserving frozen goods to proper refrigeration of meats and fish. The army of cleaning ladies and staff where I live are constantly sick and locked in the loo's. In all my time in Thailand I have never had any problem with food poisoning maybe I got lucky, however if a uk environmental health officer saw any food establishment in Thailand they would probably have a fit at the lack of any sort of food hygiene. Freshly made and cooked is the way to go in this climate. Been in hospital for five days plus , four times for food poisoning in seven years the first two times ate at a very popular hotel in Nana and once at a hotel Sukhumvit, know they were guilty as both times were for lunch and seven pm started throwing up. it really was a very dreadful and painful experience all four times, by the way the last two times street food guilty. Feel sorry for the kids but suspect it will all as per usual fade away.